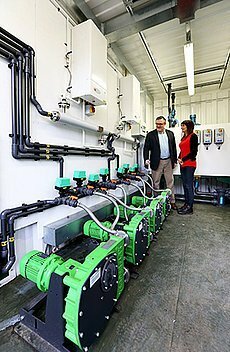 Anaerobic Digestion Microbial Fuel Cell Systems – Will these become the New “Super-Biogas Process”? Verder Peristaltic Pumps in use at a Anaerobic Digestion Using Microbial Fuel Cell Systems pilot plant. Could Anaerobic Digestion Microbial Fuel Cell Systems, become the next “big thing”! With many thousands of large commercial anaerobic digestion plants in use throughout the world, and literally hundreds of thousands of small household and community biogas plants providing energy to their owners globally, AD is now a thoroughly proven process. But, AD plants remain, in comparison with other process technologies, slow to produce their biogas, and require energy sucking high-temperatures to operate effectively. The result is that the most cost-effective examples now in use are commonly 5 to 9 metres in height, and at least 20 metres in diameter. Building anything that large requires major investment, and they take-up a great deal of space. The race is on to produce an AD Plant technology which is smaller/ needs less retention time to complete, and works at lower temperatures, while digesting a larger proportion of the organic content it is fed with, and simultaneously producing a higher quality methane. Could all that really be possible? A team of researchers thinks so, and appears to have produced a successful prototype experimental plant. They have announced that their Anaerobic Digestion Microbial Fuel Cell Systems are achieving all these aims. Plus, it is a completely new concept in anaerobic digestion! Should we get excited? Yes. There is a good argument to say that a rapid move forward in a such young technology, is perfectly possible. The renaissance of anaerobic digestion as an energy source, with its many other benefits for sustainable waste management and fertilizer production, is in reality very recent. Look at comparable inventions, and you will realize that for any other innovation of comparable complexity and potential, it took tens of years for the technology to evolve into its final form, when that final (mature) technology by then, far outstrips those early versions. Just think of the early motor car, aeroplane or ship and how much better their modern counterparts are. In fact, it is routine for the application of science to raise efficiency, and reduce cost and size hugely when compared with the original invention. “The University of Nottingham Department of Chemical and Environmental Engineering working with Lindhurst Engineering has developed Microbial Fuel Cells systems that are pioneering a new approach to AD, converting cow slurry into commercial volumes of methane gas. The process also provides cleaner wastewater and reduces odour emissions. The system is coupled either with a microbial fuel cell or a microbial electrolysis cell, depending on the operating conditions, and made from an array of anodes and cathodes connected to an electrical circuit. Verder Pumps have been assisting the team, by providing their Verderflex hose. Such has been the success provided by Verder’s Pumps that when it came to further scaling up and building two new units, Lindhurst Engineering turned once again to Verder for its pump requirements. Verder’s [Model] VF25 peristaltic pumps have been supplied more recently [to] pump the wet slurry into the digester and then pull it out, once it has gone through treatment. “For Lindhurst Engineering, of Sutton in-Ashfield, specialists in innovative mechanical and electrical engineering services, the move into AD has evolved from its expertise in water and environmental engineering. As a result of its collaboration with the University of Nottingham, Lindhurst scaled up and built a prototype digester, the H²AD, which has been operating at the University’s Sutton Bonington Campus for almost two years. Using MFC technology, it is capable of reducing treatment time to just three days, and also reducing processing costs substantially. There is huge potential for “blue skies” research of this type, but it is early days for this technology. Meanwhile, those throughout the AD industry must surely be hoping for a breakthrough in anaerobic digestion technology efficiency, to happen sooner rather than later. An enormous step forward was made by global governments in 2015, and an agreement to limit climate change temperature rises to below 2% was agreed between the nations of the world. But, since the agreement much recent global temperature data has been released which has been showing that average temperatures have been rising quite alarmingly rapidly in the last months and years. That global warming effect, if it continues on the trend of the last 6 months, could be toward a much more rapid rising than was assumed, during the climate change talks in Paris less than 6 months ago. Mankind could help itself out of the impending crisis of run-way climate change, if a “super-biogas” technology became available, powering civilisation entirely from renewable organic material, cheaply and quickly. Will that “super-biogas” technology be the H²AD Anaerobic Digestion Microbial Fuel Cell System? Read more at the Verder Pumps Peristaltic Pumps Section.